Rewire promises an awesome possibility – you use Renoise to sequence your instruments, and another DAW to handle audio tracks. 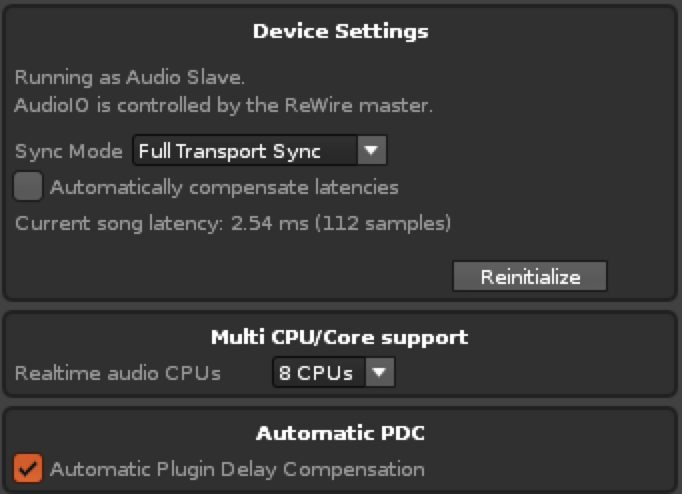 But as soon as you add a plugin that increases the PDC, you’re screwed… Renoise misses the first line (there’s a workaround), things don’t always line up, and the latency offset changes depending on whether you start playing from the slave or the master (referred to as “client” and “host” from now on). I’ve spent WAY more time testing Rewire latency fixes than I care to admit. If you’re like me and still believe there’s a way to get nice Rewire integration with a host DAW, you’re in luck: it’s really, really easy. When you’re ready to bounce Renoise’s output to audio, render it from Renoise. That’s it! Really! I can’t believe it took me this long to understand that. As long as you’re not using plugins that produce massive latencies, you should be good to go.